Escape from the daily grind and into a land of relaxation! 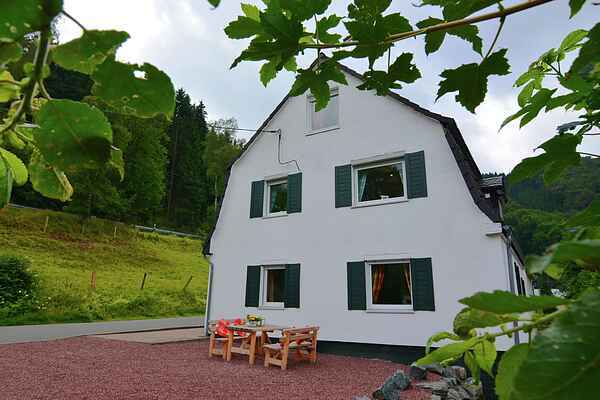 Spend your holiday in the beautiful Sauerland region in the Rothaar Mountains. Nature lovers and active holidaymakers will be in their element on the well-known Rothaarstieg hiking trail the region offers ideal conditions in any season. You can occupy the entire holiday home, which consists of three separate apartments spread out over four floors. You are sure to appreciate the location and ambience here. The terrace and garden offer inviting spots to lounge in the fresh air. The landscape and the numerous options that Sauerland offers make the region an extremely appealing destination. The well-known winter sport centres of Willingen (ski area, ski jump and ice skating rink) and Winterberg (ski area, summer toboggan run and panorama bridge) are not far from the house. Other popular excursion destinations: Bödefeld, FortFun amusement park, multiple golf courses, Hennesee (a lake with water sports, boat rides and swimming) and many more.